This bouquet from Martha is so stinking breathtaking that I honestly can't even say anything about it! I am sort of in love. Tulips are my favorite, but those are gorgeous. And I don't know why, but I am IN LOVE with the Red Hots! I am going to go out a buy a ton for one of my Apothecary jars! Red hots not your thing? 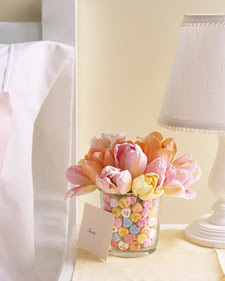 Then use conversation hearts and matching tulips! Both of those arrangements are just gorgeous! So pretty. Do you grow tulips? I have a couple varieties of lillies in my garden, but no tulips. Maybe I'll plant some just like Martha's! Love it! I love tulips, too. They are my favorite! p.s. How do you make the comments link show on google reader? I love conversation hearts, they are so cheerful. 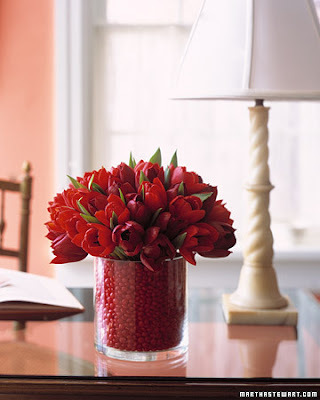 I love the arrangements, and especially the red hots! Last time you posted a comment on my blog, I was trying to figure out Lorie who? I now know! Do you have a family blog? I would love to see your kids. My e-mail address is 46kings@cox.net. Renee, I am in AZ, so no tulips for me. I love living in the desert and honestly the only thing that I don't like about it is not being able to grow beautiful flowers!! Wanted to say hello, I am a new follower and I am enjoying your blog! P.S. I love those flower and candy as well!! I love the tulips and red hots! I love both of those and together they are gorgeous! OMG! OMG! OMG! I did something ON MY OWN before seeing it on Martha?! Makes me feel special. I do that with ever season's candies. These pictures are beautiful! I need to purchase fresh flowers more often. How long do the flowers survive in the candy? Don't they need water? Not trying to be downer just wondering. Because I do love the concept Maybe I'm just not getting it. Going to see what I can discover. Never mind the earlier comment. I went to her site to see how she did it. It was as I suspected. I love this idea. Got to say it...... LOVE THIS!! I've seen her use this idea at Easter with Jelly beans. So dang cute! Oh! Jelly Beans at Easter would be VERY CUTE!!! Yep, they do need water. It is a jar inside a jar. They acutally sell vases that have an inner jar and just a little space to put candy.